Are you looking for a shoe for clipless pedal systems or does your bike have flat pedals? look a lot like casual shoes, they have a soft sole that is perfect for flat pedals (also called platform-pedals), and are used mostly for downhill riding and freeriding. The typical MTB shoe for the trailrider, tourer and racer is suitable for pedalling a clipless pedal. This means that the shoe sole has an opening for cleats. By connecting the shoe with the pedal, the pedaling force occurs not just through pushing, but also through pulling. The cleats are embedded in the thick soles of the mountain bike shoes, which makes walking in MTB shoes more comfortable than in road bike shoes. For athletic bikers who like to participate in a race now and then, the shoe should be lightweight and as stiff as possible (firm sole) so that the force transmission is optimally supported. Touring shoes with soft soles are a little more comfortable in order to provide a firm grip on different road surfaces/terrains with passages where the bike has to be carried or pushed. Test results regarding wear comfort, ventilation and stiffness are certainly useful when it comes to choosing shoes, but the most important reason for buying it is that the shoe fits you and your feet, for each foot is different. 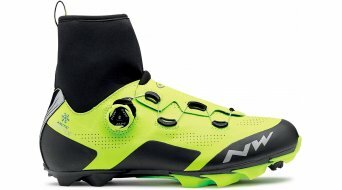 MTB shoes are available in all price categories, from the affordable shoe for beginners to the pro level, with or without clipless pedal system. What type of shoe do you want? Racing shoes, touring shoes, all mountain or Alpine cross suitable with a Vibram®-sole? 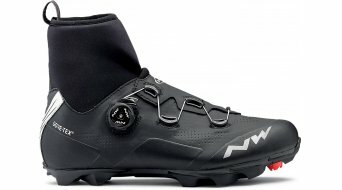 Manufacturers also offer all-weather/winter shoes for biking (e.g. with Gore-Tex® and neoprene inserts). In this shop, you'll find MTB shoes for women and men at great prices and in a wide variety. In conclusion it can be said that shoe cleats are (usually) not included in the scope of delivery, but you can find them here.